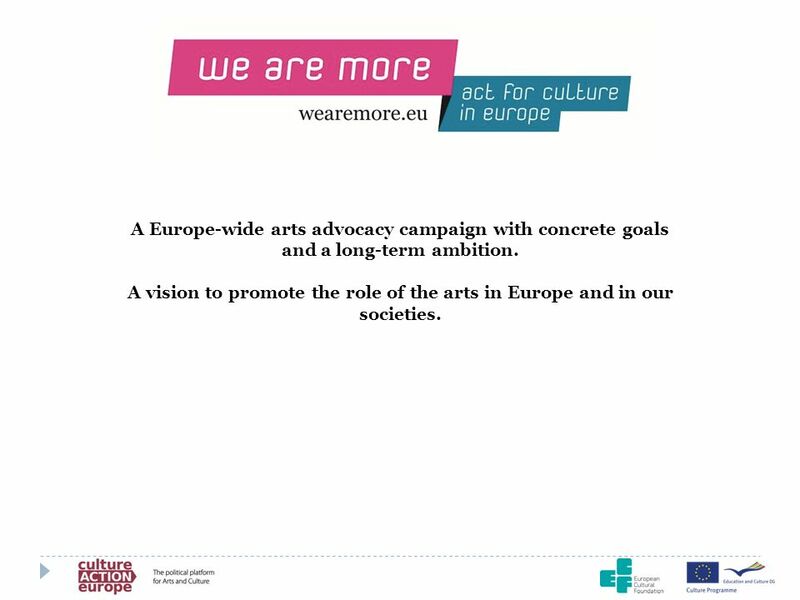 2 A Europe-wide arts advocacy campaign with concrete goals and a long-term ambition. 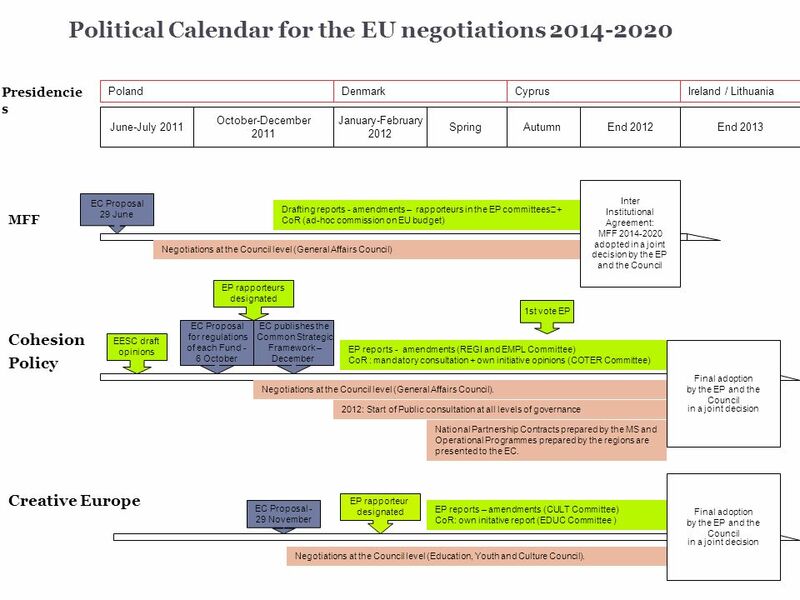 3 CONTEXT The European Union is currently deciding on its framework budget for the period through a long and complex negotiation process that begins in 2010. This is a once every SEVEN year opportunity to get the policy and funding environment right for all those who are part of European Union policies and that benefit everyone who lives in Europe. 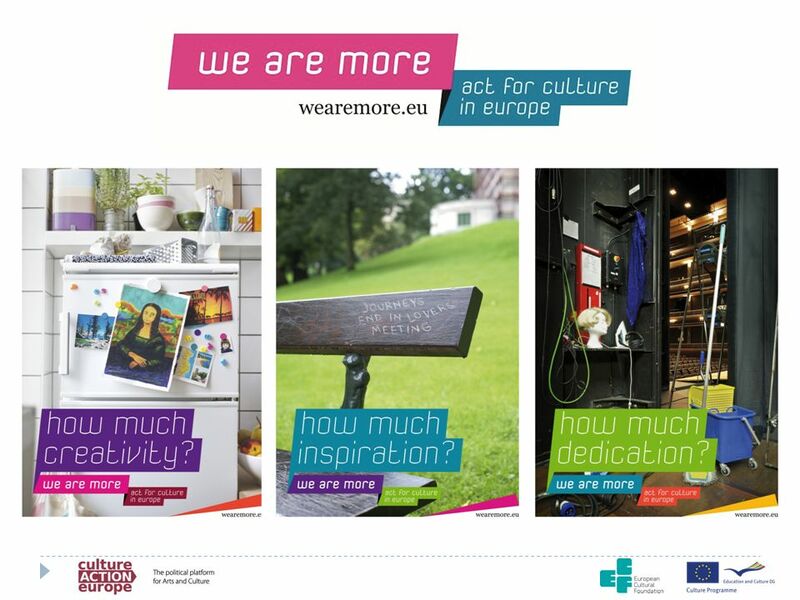 Convinced that culture, heritage and the arts play a fundamental role in the life of the European Union and its citizens; convinced that EU policies can better serve the cultural sector and enable greater co-operation both within and beyond EU borders: - NOW is the time to ACT for Culture in Europe! 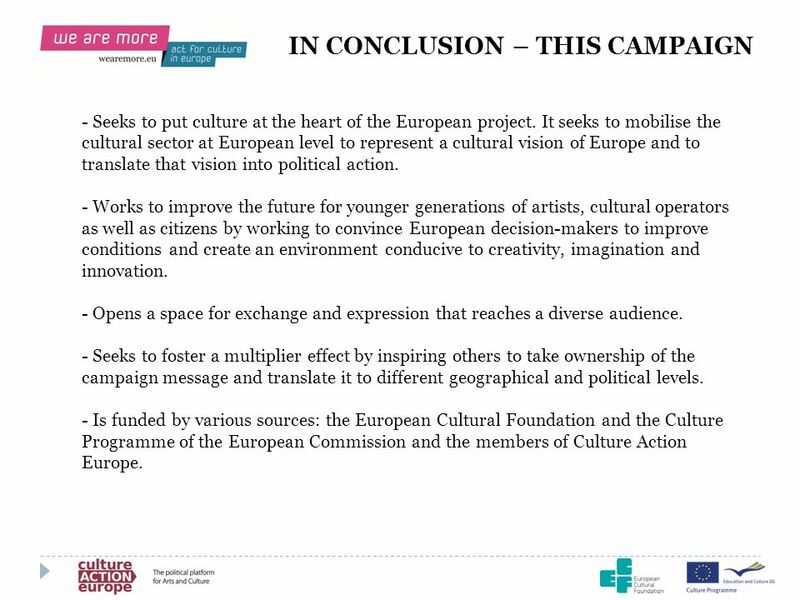 4 OPPORTUNITY This is a unique and important opportunity to mobilise across the cultural sector for a common cause. 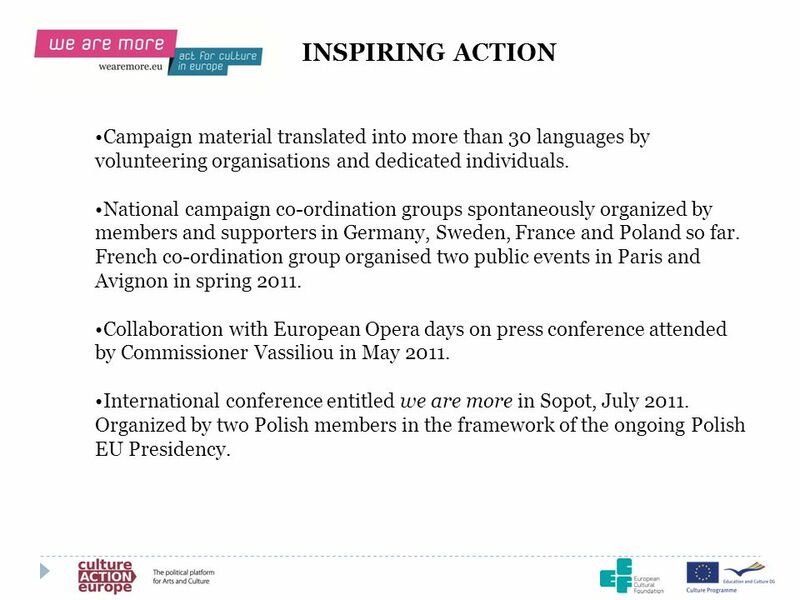 To mobilise across Europe and beyond, building greater capacity for advocacy among cultural civil society operators. 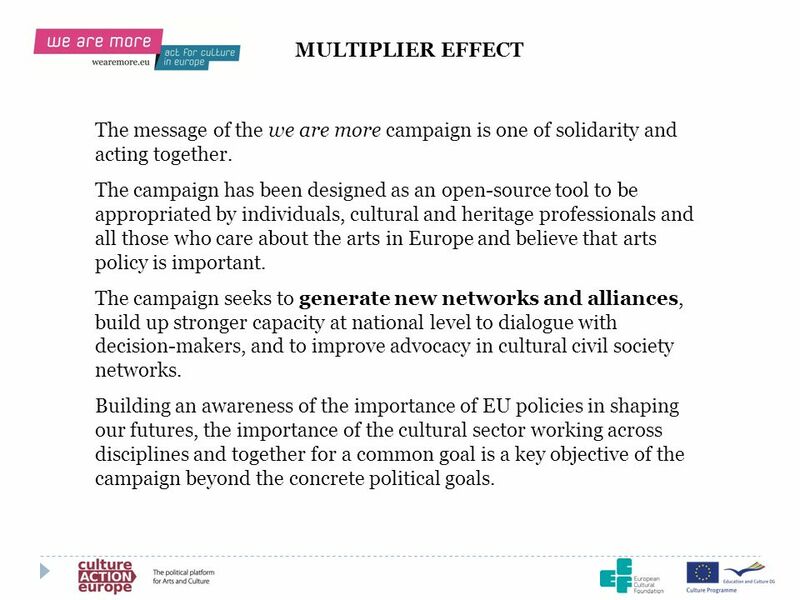 Encouraging solidarity between arts and heritage sectors; creating new advocacy tools for civil society to interact with local, regional, national and European policy makers. 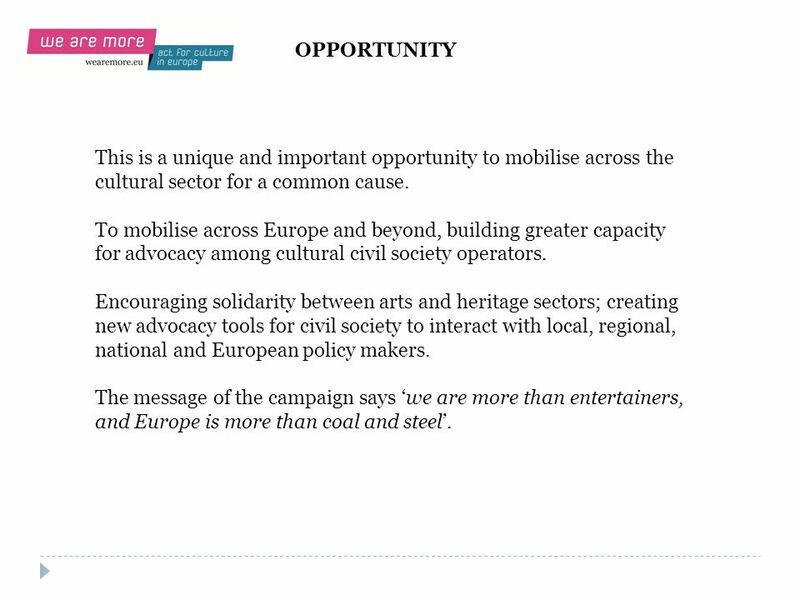 The message of the campaign says ‘we are more than entertainers, and Europe is more than coal and steel’. 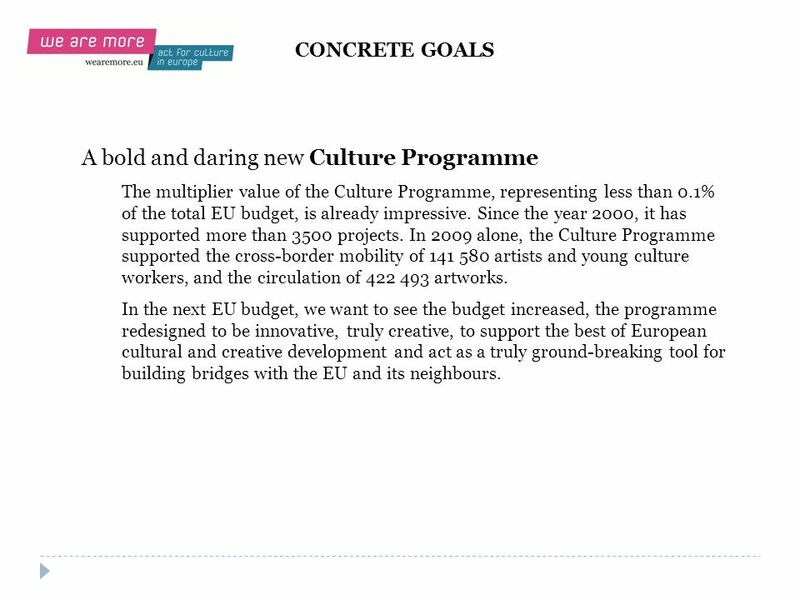 CONCRETE GOALS A bold and daring new Culture Programme The multiplier value of the Culture Programme, representing less than 0.1% of the total EU budget, is already impressive. Since the year 2000, it has supported more than 3500 projects. 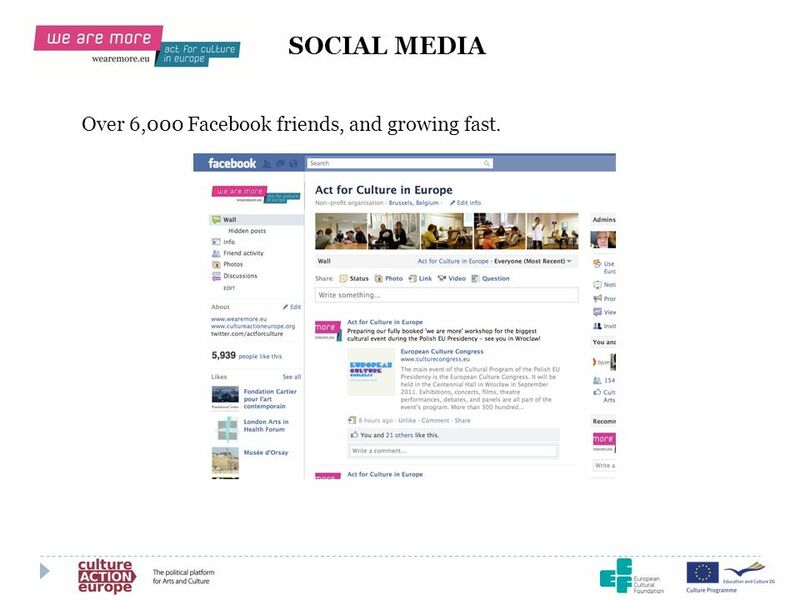 In 2009 alone, the Culture Programme supported the cross-border mobility of artists and young culture workers, and the circulation of artworks. 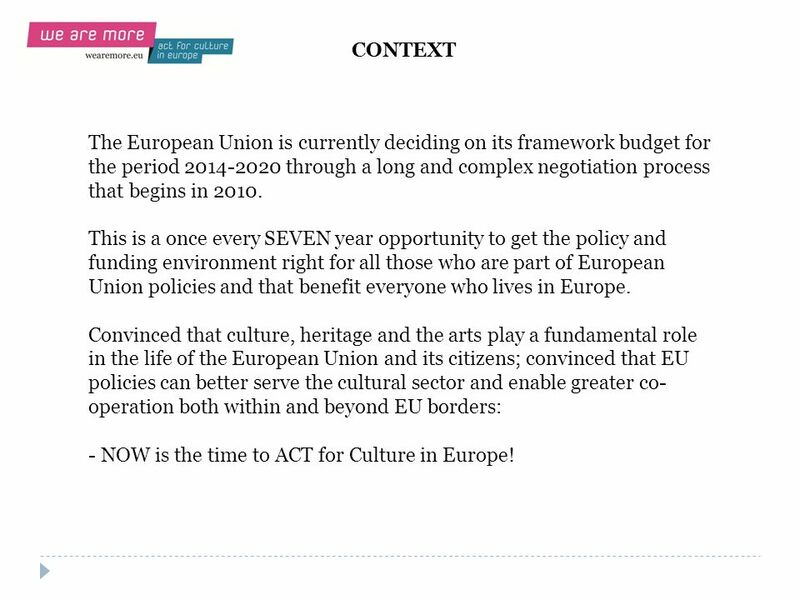 In the next EU budget, we want to see the budget increased, the programme redesigned to be innovative, truly creative, to support the best of European cultural and creative development and act as a truly ground-breaking tool for building bridges with the EU and its neighbours. 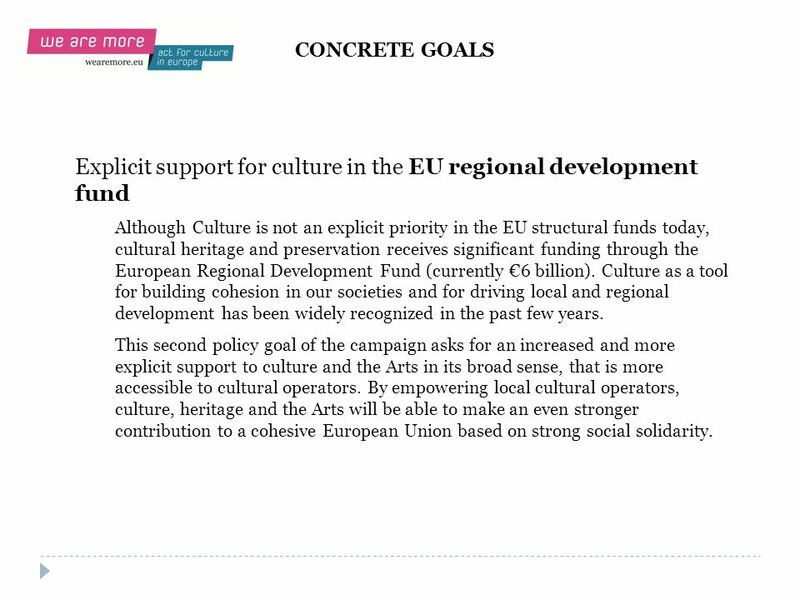 CONCRETE GOALS Explicit support for culture in the EU regional development fund Although Culture is not an explicit priority in the EU structural funds today, cultural heritage and preservation receives significant funding through the European Regional Development Fund (currently €6 billion). Culture as a tool for building cohesion in our societies and for driving local and regional development has been widely recognized in the past few years. 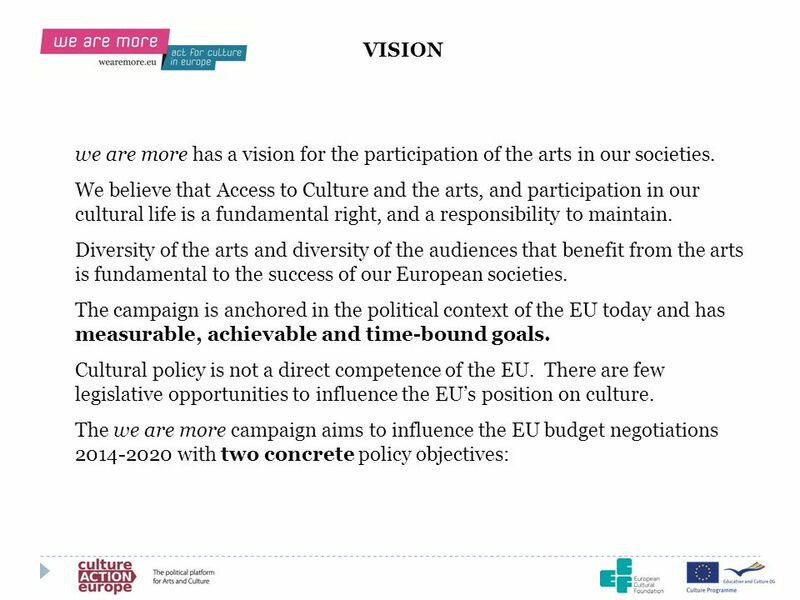 This second policy goal of the campaign asks for an increased and more explicit support to culture and the Arts in its broad sense, that is more accessible to cultural operators. 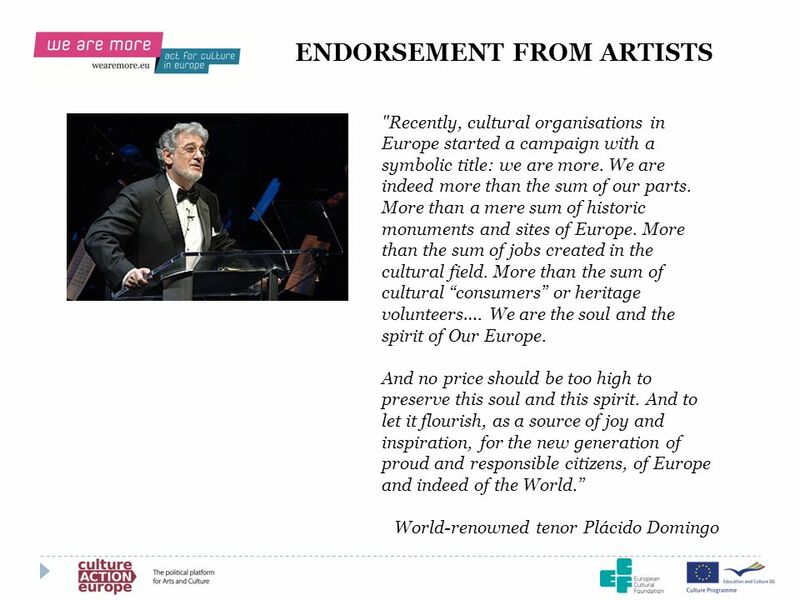 By empowering local cultural operators, culture, heritage and the Arts will be able to make an even stronger contribution to a cohesive European Union based on strong social solidarity. 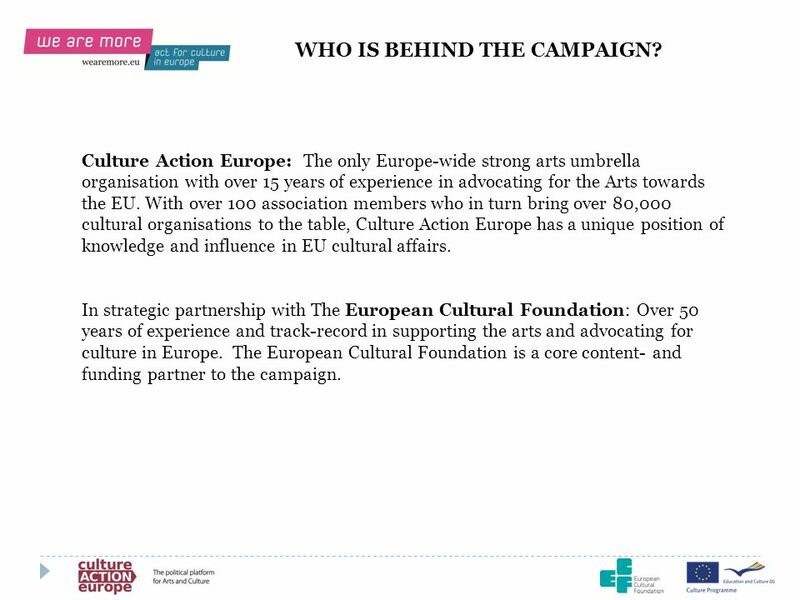 8 WHO IS BEHIND THE CAMPAIGN? 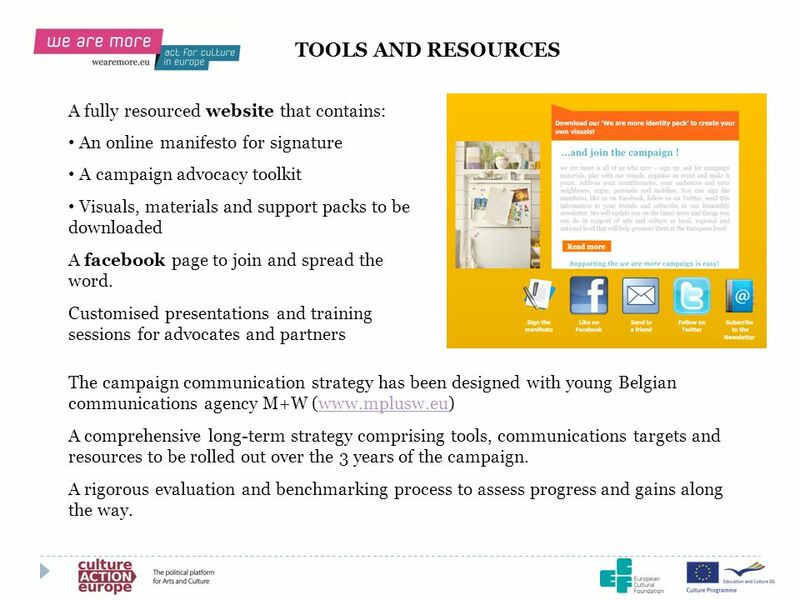 16 REACHING OUT Online manifesto already signed by over 20.000 people! Presidencies Poland Denmark Cyprus Ireland / Lithuania June-July 2011 October-December 2011 January-February 2012 Spring Autumn End 2012 End 2013 MFF Cohesion Policy Creative Europe Inter Institutional Agreement: MFF adopted in a joint decision by the EP and the Council EC Proposal 29 June Drafting reports - amendments – rapporteurs in the EP committees+ CoR (ad-hoc commission on EU budget) Negotiations at the Council level (General Affairs Council) EP rapporteurs designated 1st vote EP EC Proposal for regulations of each Fund - 6 October EC publishes the Common Strategic Framework – December EESC draft opinions EP reports - amendments (REGI and EMPL Committee) CoR : mandatory consultation + own initiative opinions (COTER Committee) Final adoption by the EP and the Council in a joint decision Negotiations at the Council level (General Affairs Council). 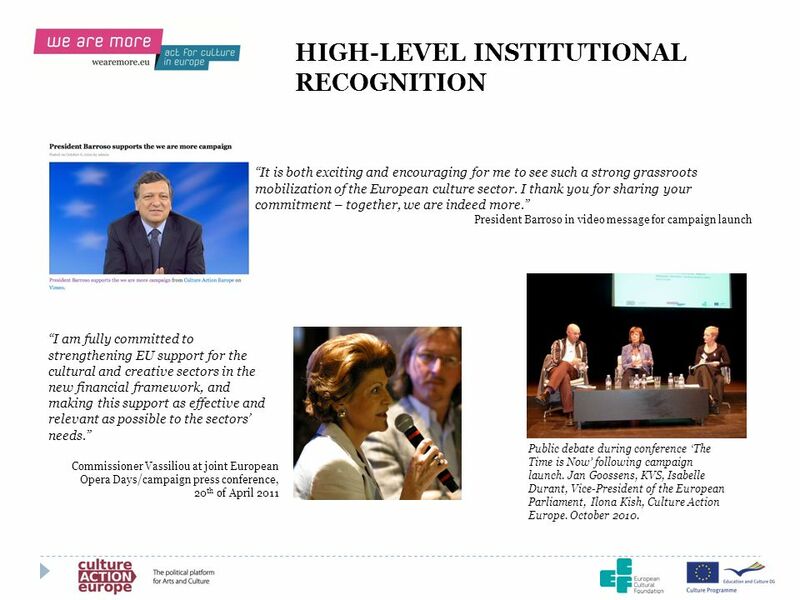 2012: Start of Public consultation at all levels of governance National Partnership Contracts prepared by the MS and Operational Programmes prepared by the regions are presented to the EC. 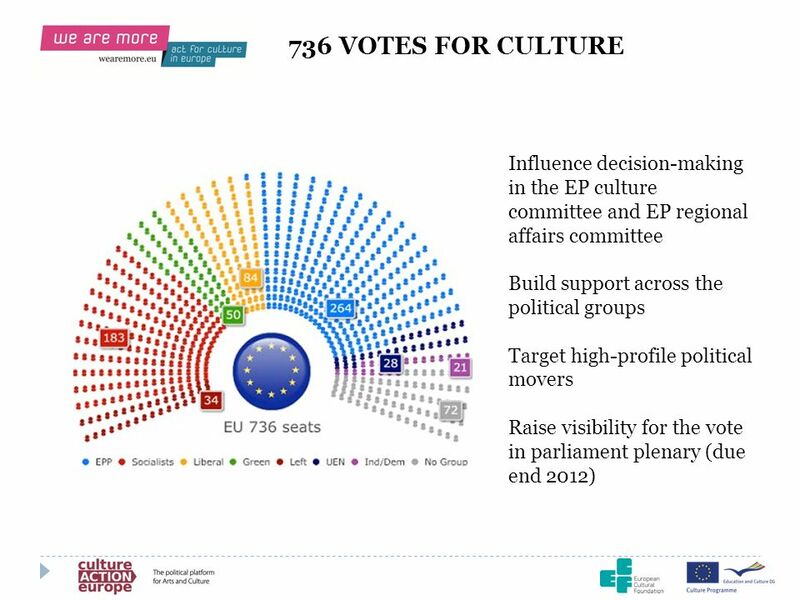 Final adoption by the EP and the Council in a joint decision EP rapporteur designated EC Proposal - 29 November EP reports – amendments (CULT Committee) CoR: own initative report (EDUC Committee ) Negotiations at the Council level (Education, Youth and Culture Council). Reforming the Budget, Changing Europe Dr. Dalia Grybauskaitė Commissioner for Financial Programming and Budget Brussels, 12 September 2007. Together. 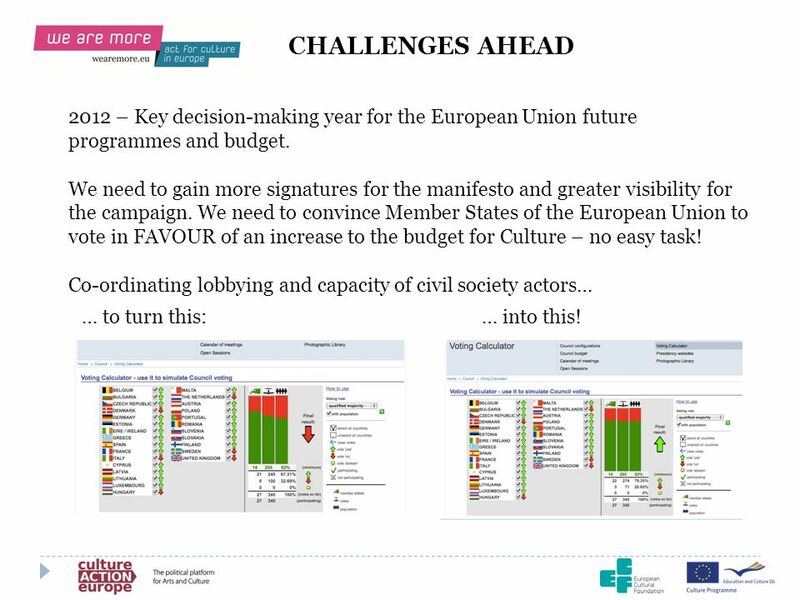 Free your energies How open and collaborative are public administrations in Europe? A benchmarking perspective October 2011. 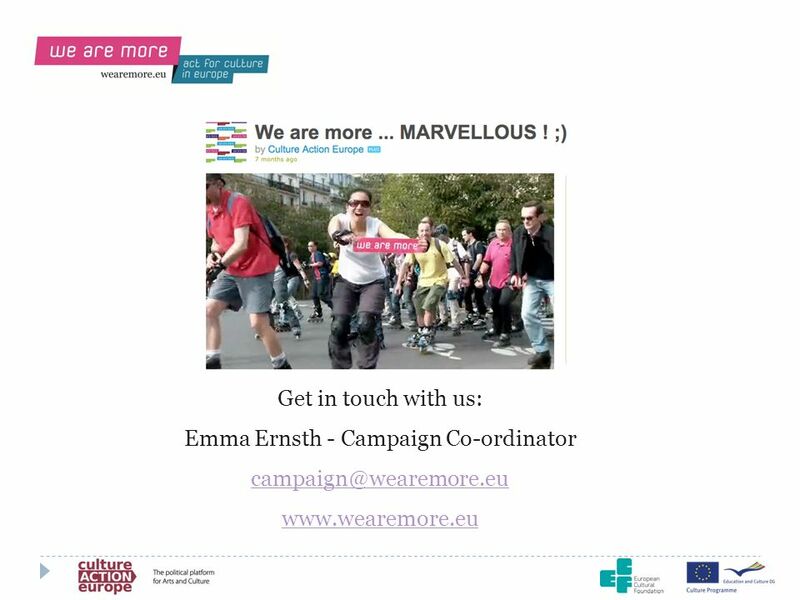 European Commission – Directorate-General Communication 1 Lessons learned from the European Year of Volunteering Preparations for the European. 9 th -19 th September 2012,Redondela. Youth in Action in figures Duration: 2007-2013 Budget: 885 million euros for seven years Geographic reach: EU Member.